In this blog post, I share some of my findings on the history of Nicole Vedrès’ early landmark of archive-based filmmaking Paris 1900 (France, 1947) at the Filmmuseum. The findings result from my research as Scholar-in-residence at the Eye Filmmuseum which I am wrapping up at the moment. As I wrote in my previous blog post on my research at Eye I was surprised to discover that Paris 1900 played a key role in the Filmmuseum’s early collection building in the late 1940s – back when the Filmmuseum was not yet the Filmmuseum but still two separate institutions, led by Jan de Vaal, the Nederlands Historisch Film Archief and the Uitkijk Archief (NHFA/Uitkijk). Paris 1900 was one of the first films bought by the Filmmuseum and was a high-risk acquisition because it was by far the institution’s most expensive acquisition so far. Beyond being a film which Jan de Vaal obviously liked, Paris 1900 was also acquired to make the case for film archiving in the Netherlands and as a starting point for building the institution’s circulating film library from the income the film’s screening fees would generate in the Netherlands. Because the film’s history at the Filmmuseum seems both a bit forgotten today and is certainly not widely known, I wanted to dig deeper into the specific circumstances of the institution’s acquisition and distribution of it. To this end, I have been doing extensive research in the Filmmuseum’s early business archive. In total, I have gone through the business archives from four years – 1947, 1948, 1949 and 1950 – looking for mentions of Paris 1900, Nicole Vedrès, Vedrès book Images du cinéma français (Editions du Chêne, 1945) and relevant correspondence with the producer of Paris 1900 Pierre Braunberger and his production company Panthéon. The business archives from these years amount to five boxes, of which the contents are ordered alphabetically – but nevertheless not very easy to navigate as there is no clear index. Moreover, the business archive also has many gaps, for instance missing letter attachments or sometimes entire letters, which is something I kept in mind when studying the material. The image below shows what the business documents from 1949/1950 look like today. Research at the Eye Collection Center. This is what the NHFA/Uitkijk’s early business documents look like, in this case documents from 1949/1950. I proceded by going through all of the documents from said years and transcribing every relevant letter in full, with the exception of two-three handwritten letters that were too hard to fully decipher. This has resulted in a document of transcriptions which is currently 115 pages long, divided into five sections – one for each box. This document maintains the order of the letters in the order in which I found them. At a later stage, I am planning to make a different version of the document of transcriptions where I order the letters into different categories – in particular acquisition and distribution – and arrange them chronologically. In doing this research I found a lot of useful information on Paris 1900‘s history at the Filmmuseum and also made some rather unexpected and exciting discoveries. Below I share four of the findings that I found particular interesting. I hope that sharing them may help scholars abroad in understanding the circulation of Vedrès’ work internationally to a greater extent than hitherto, and that in doing so I can also contribute to broadening the perspective of the current (and much needed) rediscovery of her work. …if it is possible to see the most important films, such as THE LOUISIANA STORY, EDGE OF THE WORLD, GERMANY, YEAR ZERO, THE GREEDY BOY, PARIS 1900, and eventually other important films during that week. In addition to this correspondence there is little to be found on Paris 1900 in the NHFA/Uitkijk’s business archive from 1948. However, there are several significant letters from late December that year. In that period, Jan de Vaal writes to various film societies and cultural and educational institutions in the Netherlands – for instance the Volksuniversiteit in Rotterdam or the Katholiek Instituut voor Filmscholing in Delft – asking if they would be interested in showing Paris 1900 and, if so, how many screenings they would be interested in organizing. The idea in asking this was to get a sense of whether it would be financially feasible to acquire the film with loans and pay it back by with money earned with screening fees and, subsequently, acquire additional films with the income generated. Jan de Vaal received positive reactions to this inquiry, and the decision to acquire the film must have been taken at a point in early 1949. 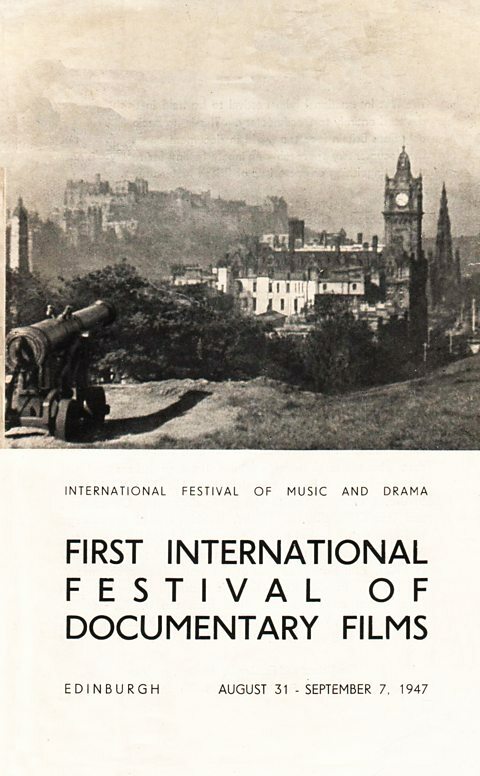 Promotional material for the first edition of Edinburgh’s International Festival of Documentary Films (now Edinburgh International Film Festival) in 1947. Paris 1900 screened at the second edition in 1948. Subsequently, de Vaal asked the Dutch Ministry of Education, Arts and Sciences for permission to take out a loan amounting to 200.000 French francs at the Dutch Bank (Nederlandse Bank) for acquiring the film (I am still trying to find a good historical calculator to figure out how much exactly that would be today). The permission for the loan was given by the Ministry’s Department of the Arts in a letter from 25 April, 1949, signed by Dr. N.R.A. Vroom. The Filmmuseum’s copies of Paris 1900 were initially not subtitled, but were given a short Dutch introduction at screenings, which was added by the NHFA/Uitkijk. The reasons for this were mostly technical and – to a lesser extent – aesthetic. In the correspondence from 1949 between among others Jan de Vaal, Ida van Dugteren and Haghe Film – then located in The Hague – it is discussed at great length if the film should be subtitled and if it was possible at all to do it. Technically, it turned out not to be possible for Haghe Film to do it – as staff members at the lab explain in a letter to Jan de Vaal from 5 October 1949 – Pierre Braunberger did not provide a soft print of the film, which they needed in order to do a subtitling. The correspondence with Braunberger is not in the business archive, but it is quite clear from other letters, that the delivery of the print was heavily delayed and initially not of a quality which the NHFA/Uitkijk had expected and which allowed for subtitling according to the most standard procedures at the time. In the end, the print was therefore not subtitled. The business correspondence suggests this solution was mainly a compromise, but was also perceived to have the advantage of not tampering with the film’s aesthetics. While the NHFA/Uitkijk initially seemed to be in favour of subtitling the print, Ida van Dugteren – who was one of the first to rent the film, on behalf of the Volksuniversiteit Rotterdam, after its aquisition – preferred it without subtitles. In a letter to Jan de Vaal from 30 June 1949, she expresses that she is happy to hear the film will not be subtitled, as she finds it would destroy the image. At the first screening of the film in Rotterdam on 30 September 1949 – also announced as the film’s Rotterdam premiere – Jan de Vaal was present himself and gave a commentary in Dutch. In this respect, the Filmmuseum’s prints of the film differ from other versions. This is perhaps one of the findings I am most excited about. In a letter sent by Jan de Vaal on 23 June 1949 to the Philips department for Experimental Television (Philips Experimentele Televisie) in Eindhoven, it appears Paris 1900 was used for an early television broadcast on film archive work (filmarchiefwerk) on 21 June 1949. In the letter, de Vaal thanks the staff at Philips warmly for their hospitality and a great organisation while noting that Paris 1900 was delivered back on time. An impression of what it looked like to watch Philips Experimentele Televisie together in 1950 in the Eindhoven region (available via this concise historical timeline in Dutch). Might these viewers also have seen parts of Paris 1900 when it was featured in one of the broadcasts in 1949? That this broadcast happened is quite intriguing for several reasons. Television in the Netherlands at that time was in its earliest, pioneering stages and still far from being institutionalized (and certainly not held in high regard). 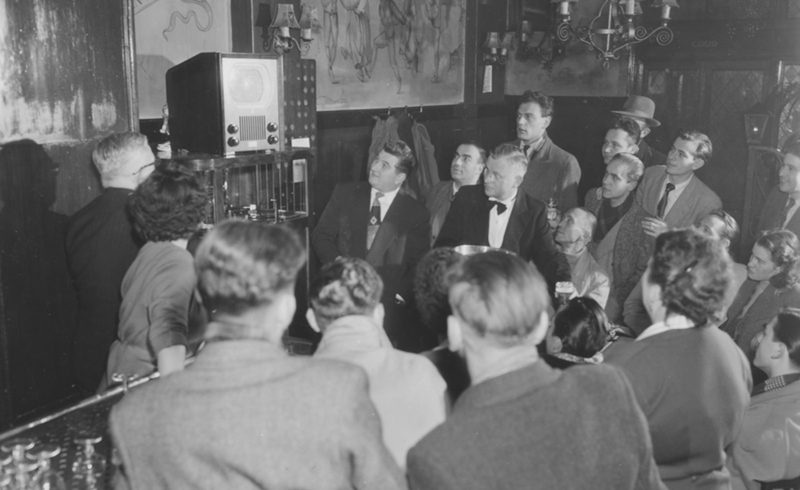 As detailed in several historical overviews Philips Experimentele Televisie broadcast three times a week and could only be received by people in a 40km (or approx. 25 miles) radius around Eindhoven who happened to own a television set in that region (that is: very few people). Between 1948 to 1951, Philips Experimentele Televisie made 265 broadcasts before television became considered a medium with a future and television production moved to Hilversum where the radio industry had flourished since a couple of decades already. I am still looking for sources and accounts which document the broadcast on film archiving from 1949. Recordings of some of the Philips broadcasts still exist, but the material I have been able to locate so far is not the easiest to access and does not give a clear answer as to what is preserved, so this requires a bit more research – something I am extremely excited about doing. Another interesting find relating to Paris 1900 is a correspondence which involves Jan de Vaal, Henri Langlois of the Cinémathèque française and the newsreel film company Polygoon. In a letter to Polygoon dated 31 August 1949 de Vaal details that Henri Langlois is currently conducting archival research in preparation for a sequel to Paris 1900 (Henri Langlois had been a possible candidate for the direction of Paris 1900 but was ultimately not assigned the task). The idea of this sequel was to go beyond a French context to cover the time during and after World War I from a European perspective, including the Netherlands. In his work for the sequel, Langlois has asked de Vaal if Polygoon would happen to have material depicting various events in their possession – among others WWI insofar as it involves the Netherlands and Germany, the Hindenburg disaster, Dutch popular life and material thematically related to inflation. On behalf of Langlois, de Vaal passes this request on to Polygoon to plan a research meeting between Polygoon and Langlois. In the answer which de Vaal receives from Polygoon dated 5 September 1949, the director Brand Dirk Ochse replies that Polygoon unfortunately does not have footage of these events as the company was only founded in 1919. Yet, Ochse kindly agrees to meet Langlois all the same, but on the condition that de Vaal communicates a precise time and date well in advance because, as he points out, Polygoon has not been able to rely on Langlois when previously setting up appointments. As part of his archival research for a sequel to Paris 1900 Henri Langlois inquired the Polygoon company – via Jan de Vaal – about material relating to specific events and aspects of Dutch culture and life. At this point I have not found other letters relating to the archival research for this sequel – this is where the business archive seems to have some gaps. Yet, it is interesting to see that there was an interest from the NHFA/Uitkijk to partake in the research for a sequel to Paris 1900 in collaboration with the Cinémathèque française and – on a more general level – a willingness to support the making of (poetic) compilation films at a very early stage. All in all, it is safe to say that Paris 1900 was an extremely important film in the Filmmuseum’s collection building and key to the institution’s very existence. Beyond the findings I have discussed here, I am also discovering paper clippings at the Filmmuseum and beyond to create an overview of the reception of Vedrès film-related work in the Netherlands. I plan to write more about this at a later stage either on my blog or in an article. I am also currently making my way through the small corpus of (extremely interesting) literature which has been published on Vedrès work in the past few years. A few months ago I read Laurent Véray’s recently published Vedrès et le cinéma (Nouvelles Editions Place, 2017) and am currently diving into to the fascinating research which Catherine Russell and Paula Amad have done on Vedrès. This academic year I have been invited by the EYE Filmmuseum to be the institution’s first scholar in its new Artist and Scholar-in-Residence program. A press release was send out to announce this end November last year. The programme has been launched to celebrate the 70th anniversary of the Collection. It gives one scholar and an artist the opportunity to work on and with material from the collection with access to its facilities and the great expertise of the Filmmuseum’s staff. Besides me, the artist Alexandra Navratil – whose work you can read more about here – has also been invited. A picture of me at EYE Filmmuseum’s Collection Center in Amsterdam Noord. It is a great honor for me to accept this invitation and also a unique opportunity for me to do research on parts of the collection which I have wanted to look into for a long time. The research I do in this context – while it is a small independent project on its own – nicely ties in with research I am currently doing within a few other projects which also involve EYE Filmmuseum. These projects are the video annotation project MIMEHIST which I have previously written about here – as well as the project The Sensory Moving Image Archive (SEMIA) – which I am yet to write about (blog posts about that will follow and are in the making). SEMIA is a project which aims to enable artistic and creative reuse of parts of the collections of EYE Filmmuseum and the Netherlands Institute for Sound and Vision. In SEMIA media historians and heritage professionals collaborate with computer scientists to extract data on different image features such as colour, movement, shape and texture to enable artists and creative users to make data visualisations of patterns and similarities in the collections in a non-evidentiary manner. Roughly this means that they can create video works and visualizations based on the collection which, rather than visualizing data for the purpose of supporting stylistic or aesthetic analyses – what scholars refer to as stylometry – seeks to visualize patterns in more intuitive and exploratory ways so as to potentially challenge the patterns which scholars observe. Yet, the project will also benefit media historical research in that it seeks to produce a search interface which allows to browse films and videos in the two collections based on visual features extracted with visual analytics software rather than with descriptive metadata. The SEMIA project’s emphasis on appropriation and artistic research offers the point of departure for my current research as Scholar-in-Residence at EYE Filmmuseum. In this post I will offer context on my research, discuss some preliminary findings and comment on a few works by filmmakers Nicole Vedrès and Nico Crama which I have been looking into. My project as a Scholar-in-Residence takes the cue from the SEMIA project and builds on my longstanding interest in experimental found footage filmmaking, recycled cinema practices and current videographic film studies. After encountering filmmaker Peter Tscherkassky‘s work sometime in 2006 I became interested in the Austrian avant-garde and the ways in which found footage filmmaking keeps mutating and productively yields new insights into film historiography and archival collections and challenge traditional written scholarship and its assumptions. Reading Nicole Brenez’ succinct Cartographie du Found Footage (2000) around that time – one of the most formative film studies essays I have ever read – I have since sought to understand how film history and its development may be depicted and analyzed with various audiovisual means. This is something I have previously written about here. Such filmmaking practices are particularly topical today as it becomes increasingly accepted for scholars to make audiovisual essays as actual publications and research output as a consequence of the emergence of videographic film studies in recent years. While scholars may not be as artistically acute as the pioneering found footage experimentalists it is certainly refreshing to see how practices developed in an artistic realm inform contemporary scholarly audiovisual essays, videography and audiovisualcy and have paved the ways for new types of scholarship. In the beginning of the year 1924, two young directors, Misters Julien Duvivier and Henri Lepage, made La machine à refaire la vie, a film approximately 3000 metres long, which, better than any text, allows to follow the accomplished progress and to observe them, by letting the different productions obtained from each period follow each other in succession on the screen. Nothing is more eloquent and instructive than this view of scenes from the same films made at years of distance and which are the best demonstration of cinema’s technical evolution. Since that point in time, multifarious ways of exploring film history through filmmaking and videography have emerged and I feel it is pertinent to say this is a particularly crucial moment for film scholarship because we can finally rework (digitized) films quite easily to present arguments about them, instead of only writing texts. Working on the SEMIA project – which will enable new data-driven artistic and historiographic practices of reuse – raises the question on how the outcome will complement current videographic practices and the appropriation works associated with the EYE Filmmuseum. Historically the Filmmuseum has been at the forefront of inviting artists to work with their collections to various ends – among them historiographic. It holds a special place in the history of found footage filmmaking, in particular because of its Bits & Pieces collection and the appropriations of its archival material in the works of artists such as Fiona Tan and Gustav Deutsch. Thus, taking the SEMIA project and my interest in found footage and videographic film studies as departure points, my research during my residency aims to critically understand the project in relation to earlier filmic appropriation works associated with the Filmmuseum. The goal is to offer historical context to the project so as to elucidate its historiographic potential and indicate productive future research avenues. In this regard, my research does not only look back at the found footage practices which emerged in the 1980s in a new light – which numerous scholars have already studied in great depth – but also considers the Filmmuseum’s earlier compilation films and documentaries which made use of its collection or which it programmed, so as to hopefully yield a more encompassing cartography of the reuse practices which the institution has engendered as a basis for comparative analysis of past and present practices. When the research is over this summer I aim to have produced a concise article which discusses three different practices and periods: first, compilation films and documentary works from (or acquired in) the 1930s to the 1960s; second, the 1980s and 1990s found footage practices mentioned above, which I will study in a new light by attending to parts of EYE’s business archive; and third more recent artistic data-driven projects such as Jan Bot and the outcomes of SEMIA. In the remaining parts of this post I offer a few preliminary observations on the first focus of my research, compilation films and documentary works from the 1930s to the 1960s. Compilations and compilation films at the Filmmuseum – Forgotten Histories? These works tend to receive little attention. They are seen as reflecting purely documentary and educational aspirations and as coming across as too overtly didactic, rather than exploring (film) history from subjective perspectives. Furthermore, they are often dismissed because of what scholars today qualify – and in many cases for very good reasons – to be simplistic views on film history and unnecessarily teleological accounts of film history’s masterpieces. Yet, as scholars increasingly embrace videographic film studies there seems to be a renewed appreciation of such films, in a pursuit to establish alternative origin points for contemporary practices in order to understand them in a broader spectrum of educational, scholarly initiatives. For instance, in a recent article film scholar Volker Pantenburg has made the case for going beyond the canonical essayistic works of Chris Marker and Jean-Luc Godard as touchstones for videographic film studies to reconsider the educational television documentaries of the Westdeutscher Rundfunk in relation to contemporary videographic film studies. Along these lines, Pantenburg makes the case for doing new archival research to dig out and critically reconsider works which we seldom consider important. Several of these films have been easy to find because they are labelled as “Film historical reflections” in EYE’s catalogue (“filmhistorische reflectie”), while others that deal with film history as a subject are less obvious even though they could clearly fit within this category. Yet, beyond their place within this category it is not always easy to determine for some of the Dutch titles whether a film has been produced by the Nederlands Filmmuseum or just acquired by it for screening and distribution purposes. For instance, the two films Eerste stappen and De Geboorte van een nieuwe kunst are archived as Filmmuseum productions and also cited elsewhere as such. However, the prints’ physical appearance suggests something else. As Mark-Paul Meyer, Senior Curator at EYE Filmmuseum, who assisted me in the viewing of these prints, pointed out to me, it is rather peculiar that these two films – both dated 1954 – have a variable density soundtrack. This indicates they could be made much earlier. We tried to determine this by going back to the old title cards of the films to see when they had been acquired. Unfortunately, the jury is still out on that one. For this reason, some of the list’s Dutch titles cannot in a clear-cut way be considered as one corpus of films produced by the Filmmuseum, and I am currently still trying to establish the exact filmography details of them. Yet, their existence in the collection certainly reflect how films acquired and screened by the institution in a certain period also reflected specific views of film history. However there are also titles which do not fit into this picture at all. This concerns the works of Nicole Vedrès and Nico Crama which show more playful and essayistic approaches in their appropriations of archival sources. In the past few months I have been doing a bit of research on their work and am currently writing it up. In the concluding two parts I share a few preliminary remarks. During my research I came across a film which I have wanted to see for years since first reading about it but never got the chance to: Nicole Védrès’ Paris 1900 (France, 1947). 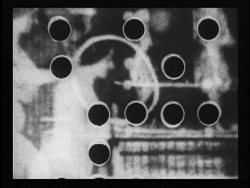 This film has often been referred to as an early example of an archive-based production in a vein of essayistic and/or found footage filmmaking. For instance at last year’s Il Cinema Ritrovato festival in Bologna where it had quite a revival in a recently restored version as part of a retrospective of Vedrès work curated by Emilie Cauquy and Bernard Eisenschitz (a video recording of a round table discussion with Vedrès’ son Laurent Vedrès, Cauquy and Eisenschitz can be viewed here). Unfortunately I could not attend Il Cinema Ritrovato last year, but now I got the chance to make up for this by watching the Filmmuseum’s print which contains a Dutch introduction and titles. Paris 1900 is a work consisting of archival footage which depicts Paris’ belle epoque and its intellectual and cultural life and habits, while tracing its decline and the emergence of conflict and war sentiments in the pre-WWI years. As such it interrogates a brief defining transitional moment in the twentieth century which invites us to think about the passage of time, our changing collective memory and power structures. Watching one of EYE Filmmuseum’s copies of Paris 1900 (Nicole Védrès, France, 1947) at the EYE Collection Centre in Amsterdam North. This title is particularly interesting for my research in several ways. First of all it intertwines in interesting ways with the Filmmuseum’s own history. As one can read in film historian and preservationist André Stufkens’ monograph Redder van de tiende muze. Jan de Vaal en het Nederlands Filmmuseum 1946 – 1987 (Uitgeverij IJzer, 2016) on Jan de Vaal – the Nederlands Filmmuseum’s director from 1946 to 1987 – the film was one of the first films bought by the Nederlands Filmmuseum – a very significant budget post at the time which necessitated loans – as a way to advocate the importance of film archiving. I would refrain from reading too much into this circumstance by aligning Jan de Vaal’s acquisition decision with Vedrès visionary appropriation of archival footage. Yet, I do find it exciting to think of this film’s early acquisition by the Filmmuseum as serendipitously establishing a beginning point for the institution’s strong commitment to lyrical and associative forms of filmmaking in the archive. The film’s simultaneously poignant historical portrayal and lyrical appropriation seems to nicely encapsulate the Filmmuseum’s origins in two very different collections which it merged with in 1952; the artistic and avant-garde repertoire films of the Uitkijk collections and the more overtly documentary collection of the Nederlandsch Historisch Film Archief. In any case, it is certainly a strong example of the richness of early filmic appropriation as a means to understand film history. Going beyond the institutional frame of EYE Filmmuseum, Vedrès’ historiographical approach also, I feel, deserves much more recognition and attention for the visionary approach it articulated during WWII and in the immediate postwar years. In particular her monograph Images du cinéma français, which consists almost entirely of film images of French cinema’s history up to that point is a deeply fascinating work. Made as a dream-like exploration of film images in a surreal fashion – the book includes a foreword by surrealist poet Paul Éluard which stresses these qualities – the juxtapositions of the images associate motifs of image features across periods, genres and styles. For instance, the volcanic eruption of Méliès’ 1902-film L’Éruption du Mont Pelée (if I am not mistaken also known as Éruption volcanique à la Martinique) is associated with images of the exploding Eiffel Tower in Luitz-Morat’s La Cité foudroyée (France, 1924). As Eisenschitz has highlighted in an eminent background article on Images du cinéma français in Trafic, the book suggests an a-hierarchical visual film history which may be considered as a counter-point to the more traditional masterpiece histories of the time which – in the way in which it used material from la Cinematheque française – also offered a blueprint for especially Henri Langlois’ exhibition practices. In brief, this is truly an astonishing and important work which Paris 1900 should be related to, in order to understand its visual analysis. I include a few scans from my own copy of the book below for an impression. Another filmmaker’s work I am looking into in my research is that of Nico Crama. In the Netherlands, and in Dutch film scholarship in particular, Nico Crama is a quite well known filmmaker because of his significant and pioneering contribution to animation and documentary film as well as his work as a producer, for instance of works by Frans Zwartjes and Paul Verhoeven. Crama made a few films – Images fantastiques 1962) and Het witte doek (1964) in collaboration with the Filmmuseum which highlighted different aspects of the institution’s activities while offering reflections on film history’s development. While the didactic aspirations of these films are clear they are far from being stale teleological tales of cinema’s birth but are rather playful in their approach showing clear affinities with the New Wave sensibilities of the time. Het witte doek – which can roughly be translated into the white screen (or canvas to be exact) – is a four-part documentary which focuses first on early cinema, then on the relation between film and literature, la nouvelle vague and the human on film. The first part is particularly interesting as a film historical reflection in the way in which it takes the cue from the Lumière brothers first train films to dissect a contemporary documentary production taking place at the Gevers Deynoot square in Scheveningen, The Hague, where a tram is seen arriving and the activities on the square filmed. The film takes a reflexive approach almost reminiscent of contemporary cinéma verité filmmaking as a way to pedagogically show what film production entails and where it came from explaining it to contemporary audiences in a historical perspective. Images fantastiques is, I think, a little gem. In its first part, Images fantastiques playfully incorporates archival material from the Filmmuseum’s collection – for instance poster material from the Jean Desmet Collection – into an animated sequence which shows differences in cinema-going at three points in time: first early cinema, then at around 1930 and finally at the point in time the film was made, when New Wave and modernist filmmaking were prominent in film programming. The film’s second part documents a screening of the Filmmuseum’s traveling cinema installed in The Hague, focusing on the encounter of a modern audience with a museal restaging of early cinema exhibition practices. In its depiction of the differences, the film is at the same time instructive and highly entertaining. In the animated sequence, the three different eras of cinema-going are depicted in three episodes where a spectator is seen leaving home, entering a cinema hall – richly illustrated with typical cinema posters of the time – to watch different films and responding to them in different ways. These episodes go backwards in time from the 1960s to early cinema. In the 1960s sequence, a glass-wearing deadpan intellectual is seen watching Alain Resnais’ Hiroshima mon amour (France, 1959). In the early 1930s second sequence, a spectator is amused by Josef von Sternberg’s Der blaue Engel (Germany, 1930). And finally, in the early cinema sequence, a spectator laughs out loud from watching the Pathé Frères comedy Rosalie et son phonographe (Roméo Bosetti, France, 1911). While clearly indebted to the time’s New Wave filmmaking, Crama’s Images fantastiques seems to suggest that film-going might have been more fun in the early days and may thus be taken to challenge the view that saw this period as merely a primitive forerunner. I include screen grabs from the three sequences below to give an illustration. While EYE Filmmuseum has a few titles by Crama and also holds his paper archive in its collection, Crama’s filmic work is preserved by the Netherlands Institute for Sound and Vision in Hilversum. The institute has made several of his works freely available for viewing online here among which both Het witte doek and Images fantastiques. These are just some of the films I have been looking into and which have surprised me in my research. By considering these titles within a broader reflection on moving image appropriation and artistic reuse I hope I will be able to yield a more fine-grained picture of the Filmmusuem’s commitment to videographic film studies in a past and present perspective, from its early days and leading up to the SEMIA project. Lameris, Bregt. Film Museum Practice and Film Historiography – The Case of the Nederlands Filmmuseum. Amsterdam: Amsterdam University Press, 2017. Seligardi, Beatrice. “Cinema Ritrovato 2017: “Paris 1900” e Nicole Vedrès, pioniera del found footage”, blog post on Cinefilia ritrovata, July 1, 2017. Stufkens, André. Jan de Vaal en het Nederlands Filmmuseum 1946 – 1987. Utrecht: Uitgeverij IJzer, 2016. Vedrès, Nicole. Images du cinéma français. Paris: Les Éditions du chêne, 1945. I am very happy to be able to announce the upcoming defense of my PhD dissertation. March 15, the PhD Committee approved my dissertation and with that also the defense date. In the Netherlands, the defense usually takes place approximately two months after the approval of the dissertation and is held as a public ceremony. Below is a glimpse of the cover of the printed version prepared for the defense. The cover image is a so-called summary visualisation of the film L’obsession du souvenir – a Gaumont production from 1913 starring Suzanne Grandais – which I created with the scientific visual analytics software ImageJ. There is more info about how and why this visualisation was created here. More info on the event can be found at the University of Amsterdam’s and the Research School for Media Studies’ websites here and here. While I find these categories fairly accurate and productive they are of course debatable, but this is how I felt the publications should be grouped together at this point. I think most of them speak for themselves but my choices of which publications to include in which sections do perhaps require some explanation. On the most basic level, it is a condition for me that a publication offers – in some way – a reflection on film historiography by discussing either a theory, model, method or representational practice which is computer-based or which uses digitised sources or digital means of analytical intervention. As a consequence many publications which discuss these categories/themes but which do not address digitisation or computerised methods have been left out. For instance for section one on “Audiovisual Essays, Found Footage and Remix Culture” there are many essays and monographs which in the past decades have dealt with the interrelation between filmic appropriation practices and film historiography but which fall out of my bibliography’s scope because they do not discuss for instance digital video editing techniques or the use of digitised film collections. The same goes for a section such as “Stylometry and Cinemetrics” which does leave out some of the fundamental reference literature for statistical style analysis from BC (Before Computers) in favour of more recent publications. Of course, it goes without saying that the bibliography is not comprehensive (suggestions and comments are more than welcome on c.g.olesen_at_uva.nl !). When reorganising the bibliography I also updated all the links associated with the publications, when applicable, so they should – at least for the moment – be working fine and forward you to additional, useful information. In addition, this update provided an opportunity for me to add more publications which have recently come to my attention. One title which I am particularly excited about is the recent monograph by film scholar and archivist Adelheid Heftberger (Austrian Filmmuseum), Kollision der Kader – Dziga Vertovs Filme, die Visualisierung ihrer Strukturen und die Digital Humanities, on the computer-based visualization of structures within Dziga Vertov’s films. This is the outcome of Heftberger’s fascinating doctoral research and the Digital Formalism project in which she meticulously annotated the shots in a group of Vertov films using the open source software Anvil. By doing this it became possible to visualize structures in Vertov’s work using different kinds of scientific, visual analytics (such as MatLab and ImageJ). In her book she discusses the broader implications of these methods both for Vertov research and for the digital humanities. The book is published in a new series on Film Heritage (Filmerbe) directed by Professor in Audiovisual Heritage Chris Wahl at the Filmuniversität Babelsberg Konrad Wolf in Potsdam. Somewhat related – but fundamentally different in its approach and scope – I have also added and recently acquired film scholar André Habib’s book La Main gauche de Jean-Pierre Léaud (Les Éditions du Boréal, 2015). Habib’s book aspires to combine a more anarchic, cinephile tradition of film appreciation with contemporary, representational practices opening with a reflection on the evocative potential of the beautiful visualizations of among other films Alfred Hitchcock’s Psycho (USA, 1960) created by San Francisco-based artist Jim Campbell. Made with ImageJ techniques (or, at least entirely reminiscent of scientific visualizations created with ImageJ techniques) Habib, I think, may with his book possibly be opening a path for film scholars who draw on cinephile theory to historicize films and who wish to define and appropriate such visualizations to their own ends within this tradition. It undoubtedly promises an exciting read in the near future! Tuesday next week I have the great honor of presenting a film program titled ‘Ken Jacobs and Early Cinema Studies’ around Ken Jacobs avant-garde classic Tom, Tom the Piper’s Son (USA, 1969-71)in the EYE Filmmuseum’s E-Cinema Academy screening series. Apart from Jacobs’ film the program will feature works by Noël Burch and Peter Tscherkassky. Below you can read my description of the program and background essay which were posted on E-Cinema Academy’s blog. 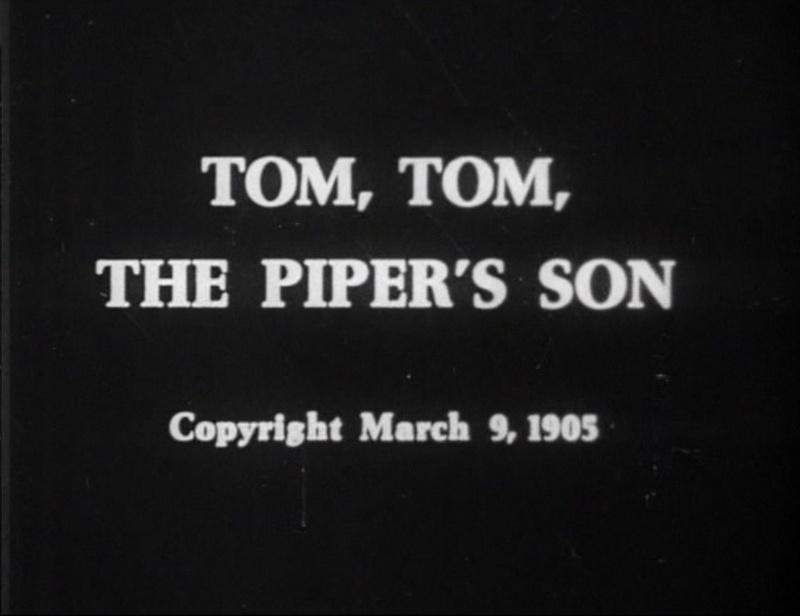 This evening presents a program dedicated to Ken Jacobs avant-garde classic Tom, Tom the Piper’s Son (1969-1971). The films in the program highlights its contribution to the revision of early cinema’s history, which occurred throughout the 1970s, and its repercussions in contemporary experimental filmmaking.